Hi, Samsung launched Samsung Galaxy A9 Pro SM A910F Nougat Official ROM. This is an Android 7.0 Nougat Official Stock Rom for Samsung Galaxy A9 Pro SM A910F and here is an easy and safe guide for new update Install Nougat Rom on Samsung Galaxy A9 Pro for INS(India Region). Samsung Galaxy A9 Pro is a Smartphone phone which is available in Dual SIM with 6.0 inch HD Super AMOLED display with Corning Gorilla Glass 4. The Galaxy A9 Pro has a 13 megapixel camera, 5 megapixel secondary cameras and runs a Qualcomm Snapdragon 652 with Adreno 510 GPU. The Galaxy A9 Pro comes with 4GB RAM, 32GB Rom. Step 1: Download and install your Samsung USB driver on your PC. Now download Odin tool and Nougat Official Rom and extract both zip or rar file in a same folder. Step 2: Enable Developer Mode and USB debugging mode on your Samsung Galaxy A9 Pro by this guide. Look for OEM unlock option and tap the toggle to enable OEM Unlock in the Developer option. If you find Verify Apps Via USB option in the Developer option, then tap the toggle to disable Verify Apps Via USB. Step 3: Now we will go to Downloading Mode, So Switch off your Samsung Galaxy A9 Pro. After then press and hold volume down key with Home key, while pressing these keys, then press and hold power button for a while and release all keys when you see ODIN Mode or Download Mode. see in the image 2. Step 4: You will see a warning massage on your Samsung Galaxy A9 Pro screen, see in the image 3. After then press Volume up key to continue or entering Download Mode. Now your Samsung Galaxy A9 Pro entered in the Downloading Mode. See in the image 4. Step 5: Now double click on Odin.exe for run Odin tool and you must check that “Auto Reboot” and “F.Reset Time“ only these two options are ticked (see in the image 2). Now connect your device to PC via USB cable in Downloading Mode. When you connect your Samsung Galaxy A9 Pro to PC then Odin tool detect your Samsung Galaxy A9 Pro automatically and show COM port and give massage in massage box. See in the image 3. Step 6: Now click on AP or PDA button in the Odin tool window and select Nougat Official Rom file (See in images 3 and 4). When you click on the PDA button Odin will ask you Nougat Official Rom file location, So browse it and select your Nougat Official Rom from Odin folder or where you save this file. Now click on Start button in the Odin tool. Step 7: Now root process start and it take few second to root Samsung Galaxy A9 Pro SM A910F. When root process will complete, then you will see green box in the Odin. see in the image 5. 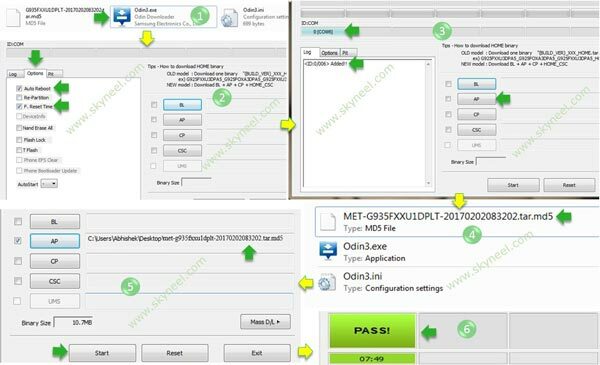 Note: In this process your Samsung Galaxy A9 Pro automatically reboot and you will get a massage pass in the Odin tool window. Now disconnect your Samsung Galaxy A9 Pro and start your Samsung Galaxy A9 Pro, It will take 5-10 minutes for first boot. After Install Nougat Rom on Samsung Galaxy A9 Pro, you can root your phone. Because root allows you to use a maximum of your phone without any restrictions. After root you will install custom apps, Rom and custom setting in your phone. But first read Root Advantage and Disadvantage by this article, then follow root Samsung Galaxy A9 Pro guide. I hope you like this Install Nougat Rom on Samsung Galaxy A9 Pro installation guide from which you will be able to easily Install Nougat Rom on Samsung Galaxy A9 Pro without any extra efforts. If feel any problem in this guide then please use comment box. Thanks to all.